With a location near Fort Sill plus free morning goodies complimentary Wi-Fi and a pool guests hit the jackpot at La Quinta Inn & Suites Lawton/Fort Sill. Free Wi-Fi microwaves mini-fridges coffeemakers and cable TV are included in all 82 rooms at the four-story hotel. Complimentary waffles cereals and unlimited coffee are served every morning. Guests can also wake up with a splash in the year-round indoor pool or with a workout in the fitness room. When duty calls the business center answers. The hotel provides on-site coin-operated laundry facilities and complimentary parking. Pets are welcome for an additional fee. Guests can find the hotel situated three miles west of I-44 and the Museum of the Great Plains and five minutes south of Fort Sill. Both Lake Lawtonka and the Wichita Mountains Wildlife Refuge are 17 miles north. 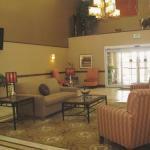 The hotel is 10 minutes from Central Mall and six miles north of Lawton-Fort Sill Regional Airport. Dogs that total no more than 50 pounds are allowed for no additional fee; there is a pet policy to sign at check-in. Dogs may only be left alone in the room if they will remain quiet and well behaved.